Using Mobile Endpoint Management to prolong smartphone battery life? Endpoint management is a term I came across relatively recently at a Symantec event – it refers to software used to manage client computers, laptops, and servers in an organisation (the endpoints of the network). Endpoint management software does things like automating the rollout of updates, manages licensing of software and often has a role in energy management of computers (ensuring they are shut down at the end of the day, not consuming resources when not in use). Also, policies can be set to ensure the power management of the machines doesn’t interfere with the installation of any patches. With the increasing numbers of smartphones and tablets entering the workplace, a new class of enterprise software is appearing, mobile endpoint management. I’ve had discussions with Symantec about this last year and had a demo of IBM’s beta Mobile Endpoint Manager at this year’s IBM Pulse. The IBM software, while not yet released, is still quite interesting. It has a considerable amount of functionality for securing devices and their data, as well as what IBM are calling micro-vpn – a nifty little bit of coding which allows for the ability to VPN from within an individual app on the mobile device. One obvious trick that’s being missed though? Energy management for mobile devices. 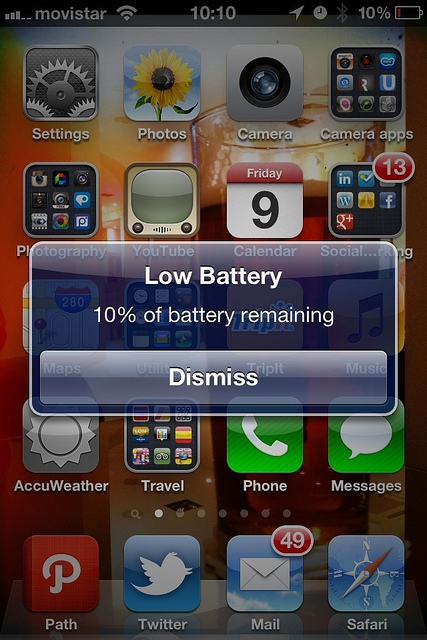 The one issue that all smart phone owners share is battery life. This is also an issue for organisations which provide smartphones to their staff because many of those employees will charge their phones while at work, increasing the organisations’ energy and carbon footprints. Potentially worse though, is if the battery does run out, the staff member in question is harder to contact and may be cut off from company resources. How do you, through software, extend the life of a smartphone battery?